Oi Cheepchaiissara's Best Seller Books. 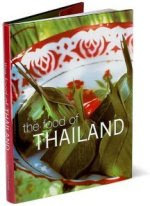 See dates/menus for 2010: THAI COOKING CLASSES, in Framlingham, Suffolk, with Oi Cheepchaiissara, author of the best-selling books "The Food of Thailand," "A Little Taste of Thailand" and "Fresh Thai." 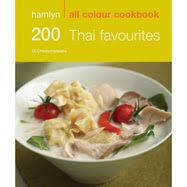 Oi has a NEW book called "200 Thai Favourites," published by Hamlyn (September 2009). 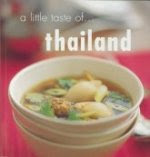 It's packed with recipes for delicious Thai meals -- 200 recipes altogether, including the variations -- and is beautifully illustrated on every layout with full colour photos. The unique selling point? It costs less than £5. You'll have more to spend on ingredients! 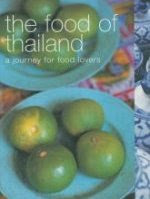 Oi's other books "The Food of Thailand," "Fresh Thai" and "A Little Taste of Thailand" have made her the world's best-selling Thai author of cookery books in the USA, UK and other countries. 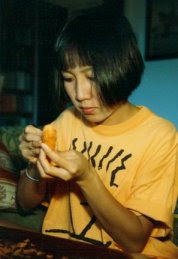 I am sure you not only enjoyed the Carvings created by Oi, but will also savor the taste of her cooking. 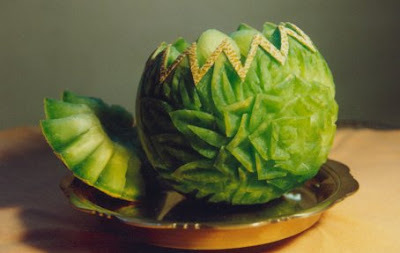 Oi Cheepchaiissara Traditional Fruit and Vegetable Carvings. 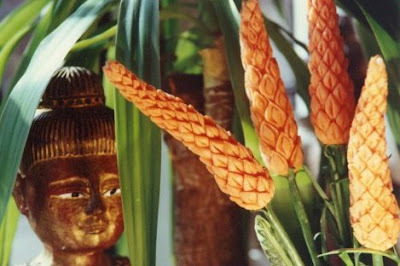 Oi Cheepchaiissara -Oi Cheepchaiissara is a food designer and caterer who teaches authentic Thai cooking and decoration. 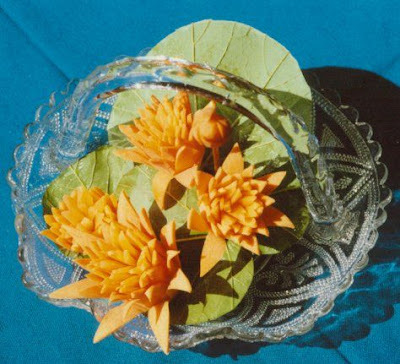 She is expert at fruit and vegetable carving, traditional Thai decorative arts that she has introduced to England where she now lives. 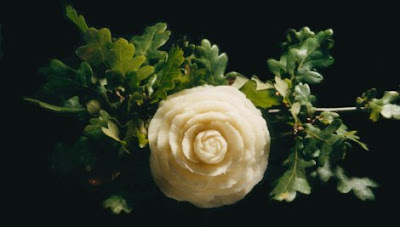 Oi also produces celebration cakes and sugarflowers to the highest quality for weddings, birthdays and other occasions. While most of her cakes are classic designs, she sometimes creates novelty cakes for children. This post is fully dedicated to her creations and I have posted a variety of her creations here for all to see. It is a privilege to portray such artists for the art they are so well known. 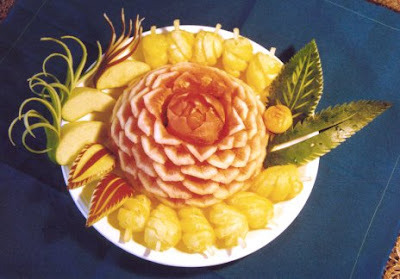 There is a long tradition of fruit carving in Thailand, especially in the preparation of food for the Royal Family. 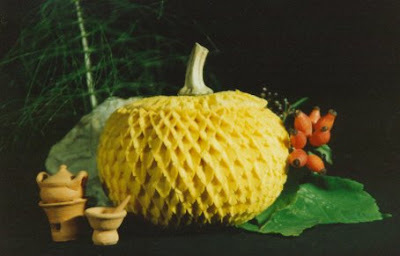 Living abroad, this artist has used fruit and vegetables readily available in the U.K. Below here you will see a variety of her best carvings using various Vegetables and Fruits. 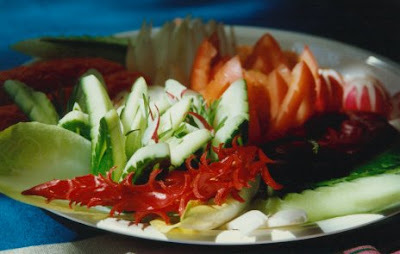 Tomato , Cucumber and Radish Carvings. 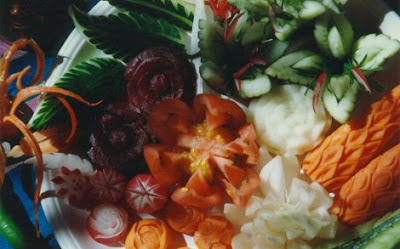 Carrots carved to look like lotus flowers. 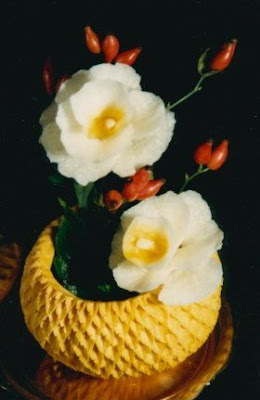 Carved pumpkin, with a decorative arrangement. 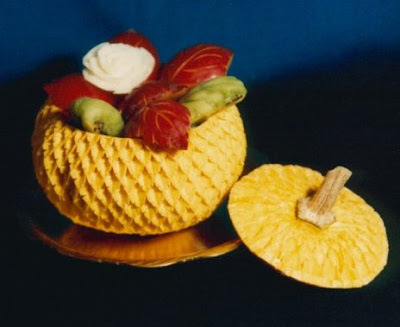 Pumpkin, filled with carved plums and kiwi fruit. 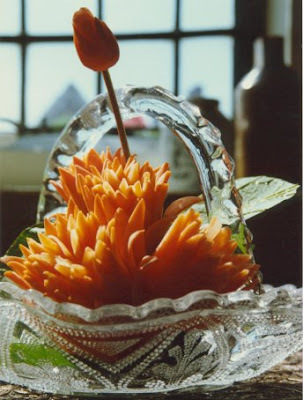 Pumpkin, with carved yam beans. 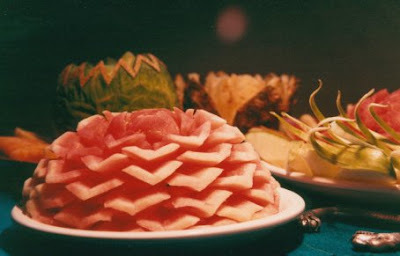 Watermelon, surrounded by pineapple chunks. 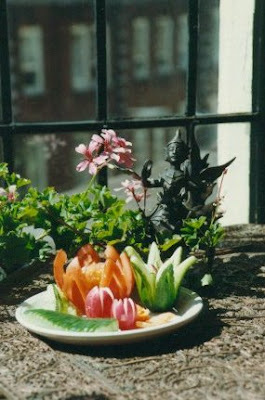 Carrots carved as Blooming Lotus! 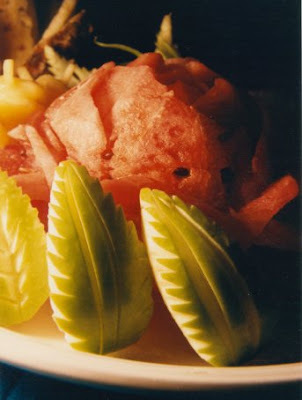 Melon, Papaya and other Fruit. 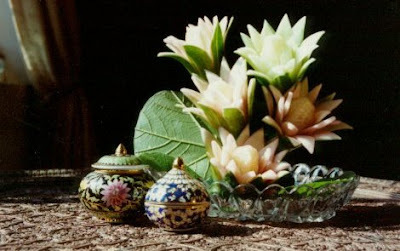 In the next post I will portray Oi Cheepchaiissara's Books for which she is so well known. Best sellers in their category.